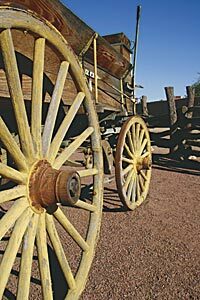 LAS VEGAS — Celebrate the season and Nevada’s historical heritage at the Old Las Vegas Mormon Fort State Historic Park. The park will be hosting two Christmas-themed celebrations in December. On Saturday, December 6, 2008 at 10:00 a.m. the park’s hands-on history program for children continues with a Christmas at Los Vegas Rancho, the name of the fort in 1860s. Families will enjoy this authentic historical Christmas, and children will make old-fashioned tree ornaments to take home. A living history program will take place when O.D. Gass, an historic character from 1865, visits the Rancho like he did at Christmas many years ago. The park is also hosting its second annual Pioneer Christmas celebration on Friday, December 12, 2008 from 5:30 p.m. through 7:30 p.m. Visitors will experience a 1860’s-style Christmas with Civil War soldiers, pioneer families, mountain men, spinners and weavers. This family friendly “Pioneer Christmas” celebration will include refreshments, live music, pictures with Santa, Dutch-oven cobblers and campfire marshmallows. The “Festival of Trees” and a Christmas train scene by the Las Vegas Railroad Club will be on display from Saturday, December 6 to Saturday December 13. The park will be collecting canned food for those less fortunate during this time. Entrance fees to the park include all the featured program activities and are only $1 for visitors over the age of 12. Children 12 and under are free. Old Las Vegas Mormon Fort State Historic Park is located on the southeast corner of Las Vegas Boulevard and Washington Avenue at 500 East Washington Avenue. For more information, call 702-486-3511. LAS VEGAS — The Old Las Vegas Mormon Fort State Historic Park is hosting its annual celebration of Nevada’s birthday and Halloween on Saturday, October 25, 2008 from 9:00 a.m. through 2:00 p.m. This family friendly “Nevadaween” celebration will include pumpkin decorating, door prize raffles, Nevada’s birthday cake, Daughters of the Utah Pioneers soup cook-off, homemade root beer, archeology muck digs, pioneer activities and games. Costumes are welcome. Entrance fees to the park include all the featured program activities and are only $1 for visitors over the age of 12. Children under 12 are free. The Old Las Vegas Mormon Fort State Historic Park is located on the southeast corner of Las Vegas Boulevard and Washington Avenue at 500 East Washington Avenue. For more information about Nevadaween call 702-486-3511. LAS VEGAS—Join the Old Las Vegas Mormon Fort State Historic Park on Friday, April 18 from 6:30 to 7:30 p.m. and Saturday, April 19 from 12:00 to 1:00 p.m. for a once-in-a-lifetime reenactment of President Lincoln and Secretary of War, Charles A. Dana’s conversation regarding Nevada’s statehood and the end of the Civil War. This prologue will be presented by Michael Green, respected author and historian of the College of Southern Nevada. Live music with a choir will also be performing. LAS VEGAS, Nev.–Join Peter Huntoon, one of the country’s most respected bank-note researchers, authors and collectors, at the Old Las Vegas Mormon Fort State Historic Park on March 25, 2008 from 6:30 p.m. through 7:30 p.m. to speak about Civil War currency. Live accordion music will be performed by Dean Burt, while you enjoy refreshments. Civil War currency will be on display from March 24 through April 3, 2008, courtesy of Sahara Coin. It was tough living in Las Vegas in 1855. That’s the year that 30 Mormon missionaries from Utah established a small colony in the remote Las Vegas Valley. Creating the settlement wasn’t an easy job. In addition to having no air conditioning or room service, colonists had to plant crops for food, erect their own places in which to live and cope with intolerably hot temperatures.